The souvenir consists of two creme colored cards measuring 3 x 5 1/4 tied together with red silk cord. On the face of the first is the name of the school, town, teacher, date, and officers in bright gold lettering. The photograph of the teacher is included on the front. On the second card are the names of the students in red ink. The card is heavily embossed in a tulip pattern. Sept. 4, ’99 – Mar. 2, 1900. Keya Paha County, Nebraska, was a farming community; all of the parents of the students listing their occupations on the 1900 census as farmers or stock raisers. By the 1900 census twenty-year-old Miss Jackson is no longer living in Keya Paha County (if she ever did), but is living in a boarding house in Omaha City owned by Dora Morton. Miss Jackson lists her occupation as teacher and it is unknown if she has moved to Omaha for employment, or whether she will return to Keya Paha to teach. Miss Jackson teaches a wide age range of students, the youngest five-year-old Ernest Norwood to the eldest, eighteen-year-old Thomas Riley. A difficult task under any circumstances. Miss Jackson is only two years older than her oldest student. I spent the first three years of my school life in a one room school house with the same age ranges. The five-year-olds were too young for a full day of school and slept at their desks for most of the afternoon. The older boys could not help themselves, they threw spit balls, laughed out loud, and annoyed the girls when the teacher wasn't focused on them. Even with every name listed, this was one of the most difficult research projects I have attempted. The enumerator, Mr. William Knudson - bless him, had very difficult to read handwriting and could not spell. I'll give him credit for attempting to spell the names phonetically, but in most cases he wasn't close. Like L.W. Crawley of The Virtual Dime Museum in her post "Viavi Case Study #2: Ida (Smith) Kane," I had to read the entire county of Keya Paha line by line, and even then could not find all the names. I was relatively sure some of the children listed were those children in the only families of the same name in the census, but could not of good conscience attribute them as it just wasn't clear enough. What I found very interesting was the concept of the card and the company that manufactured the card. This concept apparently took form in 1898 with the inclusion of photographs in 1897. The card was produced by the Nstructor Company of Dansville, New York, It appears that prior to 1900 the Company was known as Teachers Improvement Company of Dansville, New York. This company spent a great deal of money in directed advertising with full page ads in The American Primary Teacher. The following article was written in the American Primary Teacher Magazine of 1897 indicating the cards may have only been used a year or two prior to 1897. The article and advertisement also indicate that the addition of the teacher photograph to the card was very recent. 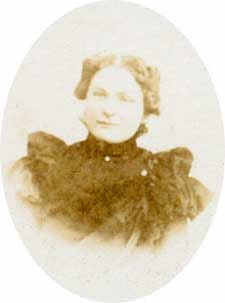 Miss Jackson may have been a reader of The American Primary Teacher and convinced the school board, all of whom had children in school, to order the cards. Most of the parents were immigrants and must have had a great respect for education as several of the male students were attending school at the ripe old age of eighteen rather than having quit much earlier to work on the farm. As you will read, the advertisement hit all the ego, history, and education buttons to compel the School Board to spend a princely sum for a souvenir. The perplexing question, “What shall I give my pupils at the close of school or at Christmas?” has bothered many a poor teacher’s head, and perhaps in some cases has used up as much nerve energy in deciding as would two or three weeks of ordinary school work. 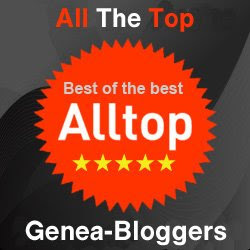 Therefore, anyone who steps in and settles the matter for thousands of teachers does in the aggregate an immense amount of good in the educational world. 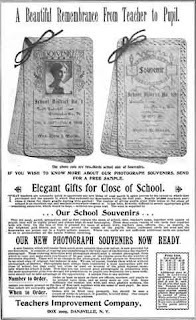 This is just what the Teachers’ Improvement Company of Dansville, N.Y., seems to have done in the introduction of their handsome school souvenirs. The idea was a good one, and it is no surprise to learn of its wide popularity, over ten thousand teachers making use of them last year. 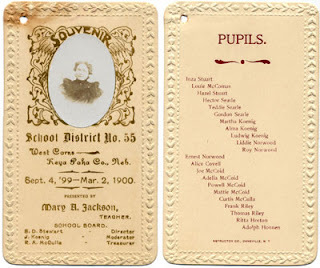 Not only are these cards neat and tasty, but containing as they do names of pupils, teachers, and officers, they are a most valuable memento, increasing in value as the years go by and the companions of school days drift apart. In this respect the time-honored stock “reward card” can not be compared with them. And though printed separately for each school, the price is so low that any teacher can afford them. For close of school, for Christmas, or for any anniversary, they are equally appropriate. The price was $1.00 for 15 cards plus 25% more for the inclusion of a photograph. What cost $1.05 in 1899 would cost $25.84 in 2007. 1900 U.S. census, Keya Paha, Nebraska, population schedule, Pine, p. 279, dwelling 211, family 211, Edward Riley (Head); digital images. Heritage Quest (http://persi.heritagequestonline.com/ : retrieved 23 May 2008); citing NARA microfilm publication T623, roll 931. 1900 U.S. census, Keya Paha, Nebraska, population schedule, Pine, p. 279, dwelling 212, family 212, Edward K. Riley (Head); digital images. Heritage Quest (http://persi.heritagequestonline.com/ : retrieved 23 May 2008); citing NARA microfilm publication T623, roll 931. 1900 U.S. census, Keya Paha, Nebraska, population schedule, Pine, p. 279, dwelling 213, family 213, Thomas Koenig (Head); digital images. Heritage Quest (http://persi.heritagequestonline.com/ : retrieved 23 May 2008); citing NARA microfilm publication T623, roll 931. 1900 U.S. census, Keya Paha, Nebraska, population schedule, Pine, p. 279, dwelling 215, family 215, John Koenig (Head); digital images. Heritage Quest (http://persi.heritagequestonline.com/ : retrieved 23 May 2008); citing NARA microfilm publication T623, roll 931. 1900 U.S. census, Keya Paha, Nebraska, population schedule, Pine, p. 279, dwelling 216, family 216, Charles Searle (Head); digital images. Heritage Quest (http://persi.heritagequestonline.com/ : retrieved 23 May 2008); citing NARA microfilm publication T623, roll 931. 1900 U.S. census, Keya Paha, Nebraska, population schedule, Pine, p. 280, dwelling 217, family 217, Salon Stuart (Head); digital images. Heritage Quest (http://persi.heritagequestonline.com/ : retrieved 23 May 2008); citing NARA microfilm publication T623, roll 931. 1900 U.S. census, Keya Paha, Nebraska, population schedule, Pine, p. 280, dwelling 218, family 218, Robert A. McCully (Head); digital images. Heritage Quest (http://persi.heritagequestonline.com/ : retrieved 23 May 2008); citing NARA microfilm publication T623, roll 931. 1900 U.S. census, Keya Paha, Nebraska, population schedule, Pine, p. 280, dwelling 219, family 219, Wilson Norwood (Head); digital images. Heritage Quest (http://persi.heritagequestonline.com/ : retrieved 23 May 2008); citing NARA microfilm publication T623, roll 931. 1900 U.S. census, Douglas County, Nebraska, population schedule, Omaha, p. 197, dwelling 182, family 219, Dora Morton (Head) – Mary Jackson; digital images. Heritage Quest (http://persi.heritagequestonline.com/ : retrieved 23 May 2008); citing NARA microfilm publication T623, roll 925. 1900 U.S. census, Keya Paha County, Nebraska, population schedule, Omaha, p. 280, dwelling 222, family 222, Mother McCoye (Head) McCoid; digital images. Heritage Quest (http://persi.heritagequestonline.com/ : retrieved 23 May 2008); citing NARA microfilm publication T623, roll 931. American Primary Teacher. 1897. Boston: New England Pub. Co., pg. 397.